SOME HEROES HAVE 4 LEGS … REST IN PEACE SWEETIE. Bretagne, the last known living 9/11 search dog has passed away at the age of 16. 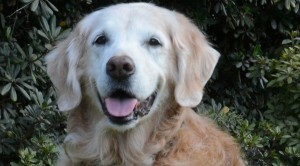 A statement from the Texas A&M Engineering Extension Service says Golden Retriever Bretagne was put to sleep on Monday at a veterinary clinic in the Houston suburb of Cypress. Bretagne, (pronounced, “Brittany”), was just 2 years old when she and her handler, Denise Corliss, took part in the 9/11 search operation in New York. They spent 10 days at the scene searching rubble for human remains following the terror attack on September 11, 2001. 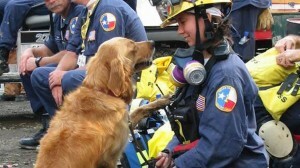 Bretagne not only served at Ground Zero, but BarkPost explained she also helped with search and rescue in New Orleans after Hurricane Katrina. Bretagne retired from active duty aged nine. And now we say goodbye to this precious and beautiful dog. When it was time to say goodbye, she was given a hero’s farewell. 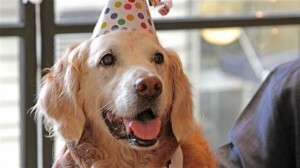 A doggy’s birthday for one of the brave who searched following 9/11 where Bretagne was given the “Kibble to the City”. In September, BarkPost teamed up with 1 Hotels to give the beloved dog a day of celebration in New York City for her 16th birthday. The day was known as “Dog’s Best Day,” an on-going series from BarkPost that celebrates deserving dogs. Bretagne was whisked throughout the city that day and given the hero treatment. It started with a limo at the airport and then a suite over looking Central Park at 1 Hotel. Bretagne was then taken to see a personalized billboard in Times Square displaying a happy birthday message. She even received the doggie “Key to the City” presented by Hudson River Parks. And as we say goodbye to a true American hero, Bretagne is walked, by her handler Denise Corliss, past a flank of members of the Cy-Fair Volunteer Fire Department and given a fireman’s funeral. Goodbye Bretagne, thank you for your service and your companionship. Rest in Peace. If this does not bring a tear to your eye and a lump in your throat, you may not have a heart. The 9-11 museum at Ground Zero in New York City tells the grim story of that fateful September morning in 2001 when terrorists attacked the United States and changed our lives forever. The museum contains artifacts and exhibits that pay tribute to the innocent people that were killed that day and the first responders, police and firefighter heroes who ran into the buildings and paid the ultimate sacrifice. There is also about 8,000 unidentified body parts stored out of sight in a “remains repository” at the museum’s underground home. How does something like this have a gift shop? It is not only absurd, it is completely tasteless and offensive the the families and friends who lost loved ones that day. It just seems so wrong, but the museum does need funds to exist. The Gothamist points out that the Holocaust Museum have gift shops as ways of funding. It also has a gift shop. The 9/11 museum’s cavernous boutique offers a vast array of souvenir goods. For example: FDNY, NYPD and Port Authority Police T-shirts ($22) and caps ($19.95); earrings molded from leaves and blossoms of downtown trees ($20 to $68); cop and firefighter charms by Pandora and other jewelers ($65); “United We Stand” blankets. There are bracelets, bowls, buttons, mugs, mousepads, magnets, key chains, flags, pins, stuffed animals, toy firetrucks, cellphone cases, tote bags, books and DVDs. Even FDNY vests for dogs come in all sizes. -?A black and white “Darkness Hoodie” printed with an image of the Twin Towers. The pullover, like other “Darkness” items, bears the words “In Darkness We Shine Brightest.” Price: $39. -?Silk scarves printed with 1986 photos by Paula Barr, including a panoramic view of the Manhattan skyline. Another depicts “lunchtime on the WTC Plaza.” They go for $95 each.